Hac 07 II - Freiburg, Germany. Group photo of hackers. 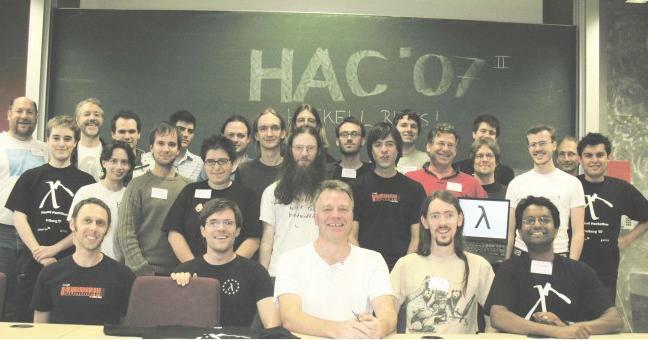 The 3rd Haskell Hackathon will be held over 3 days, October 5-7 2007, at the University of Freiburg, in conjunction with the Haskell Workshop and ICFP 2007. It is a coding festival, focusing on producing and improving Haskell libraries, tools and infrastructure. To attend please register, and get ready to hack! Note: that it is not necessary to register for ICFP, or any of the associated conferences, if you only want to go to the Hackathon. The Hackathon itself will be free, but you will have to pay for travel, accommodation and food. If you will be attending add your name to the Registration page. Numbers may be limited, depending on availablity of space. The Hackathon will take place at the same venue as the IFL workshop, at the Faculty of Applied Sciences of the University of Freiburg. The room is 02-016 in building 101. You can reach the hackathon venue from the main train station by taking the "Breisgau S-Bahn" from "Freiburg - Hbf." to "FR Messe/Universitt". Here is a timetable (pdf). Please note that most but not all trains stop at the hackathon venue. Also, some trains only run Monday to Friday ("Montag - Freitag") or on Saturday ("Samstag"). Alternatively, you can walk from the city center to the hackathon (20 - 30 minutes). The map shows the exact route. The Hackathon will be integrated with the university summer campus. This will give us all the infrastructure (room, Internet, etc) at minimal hassle. Note: There won't be any stationary PCs, so you should bring a laptop with you. For local information (travel, accommodation etc) see the ICFP local info page. The Hackathon will, tentatively, be held from 10am to 6pm each day, with dinner after at local venues. Install an up to date Haskell toolchain (ghc-6.6.1 and if you like a recent snapshot of ghc-6.8.0 also). Add ideas here for which you think hacking together as a group (rather than individually) would be beneficial. Building tests that give 100% code coverage for package base. bit parsing layer for Data.Binary and a network protocol demo? improve the performance of DiffArray using modern techniques OCaml impl. Haskell WSGI (http://www.python.org/dev/peps/pep-0333/) equivalent with a reference server implementation. Library to allow Haskell to communicate with Erlang processes using the Erlang message protocol. A better curses rss client than snownews: support ^L resize signal, and parallel feed downloading. benl23: Optimize new graph colouring register allocator. Courtesy of the Programming Languages Group at the University of Freiburg. AJG: What can Galois do to help? The Freiburg background is available under the GNU Free Documentation License, from wikipedia. This page was last modified on 15 January 2009, at 09:03.